If you are new to the Bengal breed, you’ll find a brief introduction here. Please also see the page “Before you Buy” before you begin your search for available cats or kittens. Bengal Cats are spectacularly fun, sociable, gorgeous pets, but they are not for everyone. 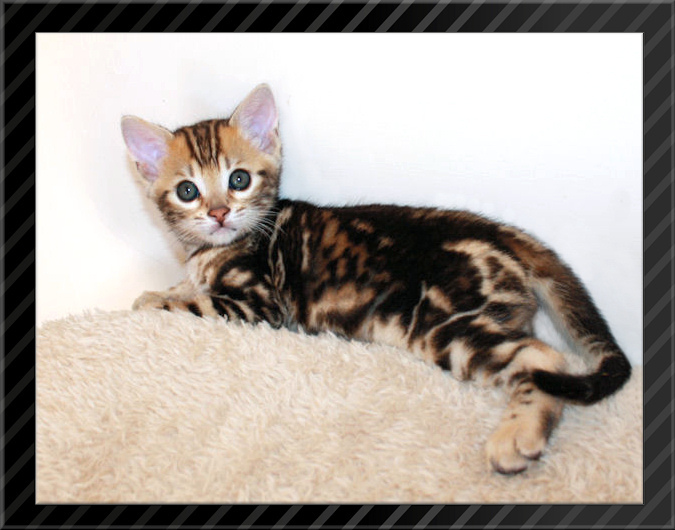 Is a Bengal Cat the right cat for you? There are of course many things to keep in mind, the first of which is to DO YOUR HOMEWORK. Research the Bengal breed to make sure they are right for your needs and your lifestyle. 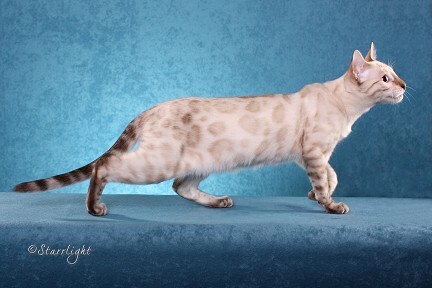 Bengals, especially those that are F4 or more (four or more generations from an Asian Leopard Cat) make wonderful pets, and the earlier generation cats can be also. But this breed is not for everyone. Bengals are very active, intelligent, curious cats. Don’t be too surprised to see a Bengal leap from the floor to a shelf hanging on the wall or your mantel, they love to jump and watch the world from the highest places they can get to. They are typically very sociable and love to help you with whatever you are doing, but many are *not* lap cats and and do not like being held in a restraining manner. They are definitely not couch potatoes, and for example, one Bengal Cat would not be happy without a companion in a home if you have long days at work, and will entertain themselves however they can! Their lifespan, diet, and other needs are basically the same as any other domestic cat. Important note: there are a few locations where Bengals are not legal to own, due primarily to misinformation and ignorance regarding the nature of the breed. 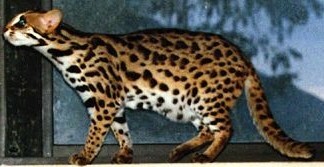 In the USA, Denver, New York City, Alaska, and Iowa allow Bengals only if they are 3-4 generations or more from an ALC. Connecticut also has specific restrictions. If you live in one of these areas, you should follow up on the legal status of owning a Bengal. See helpful links below. Please see the Before you Buy page for things to remember before you purchase or adopt. BCD has over 1,700 followers on Facebook!